President Barack Obama won re-election with a similar coalition that carried him to the presidency in 2008: women, young voters, African Americans and Latinos. But the popular vote was not as strongly in Barack Obama’s favor this time, owing to declines in some key but shrinking parts of the electorate. Men and women split between the candidates: overall, 55% of women voted for Barack Obama, 44% for Mitt Romney. For men, 52% voted for Mitt Romney and 45% for Barack Obama. In 2008, Barack Obama gained a higher percentage of the male vote (49%) and a similar percentage of the female vote (56%). However, there was a division between married and unmarried women: 53% of married women voted for the Republican candidate, while Barack Obama won unmarried women two-to-one: 67% to 31%. Overall, women make up more of the electorate – 53% – slightly more than their share of the US population. 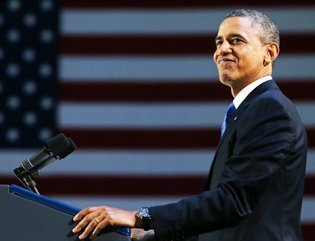 Barack Obama overwhelmingly won the black vote with 93%, a sliver lower than four years ago. Latinos also voted strongly for the Democrat – 71% in total and probably made electoral differences in Colorado and Nevada. Latinos or Hispanics made up 10% of total voters in the US, up one percentage point from 2008. President Obama lost some of the white voters that propelled him to a strong win in 2008, with 39% voting for a second Barack Obama term in comparison to 43% in 2008. The white electorate, while still a majority, dropped to 72% of the country as a whole, down from 74% four years ago, and 77% eight years ago. Young voters were a key part of Barack Obama’s victory for a second time. Sixty per cent of voters aged 18 to 29 years voted for Barack Obama, slightly down from his percentage four years ago of 66%. But the percentage of voters in this age range increased slightly, to 19% of the electorate. Voters aged 30 to 44 were fairly split, with a slight inclination to Barack Obama, 52% to 45%. The largest percentage of the electorate in terms of age, 45 to 64, went to Mitt Romney with 51%. Lower-income voters went decisively for Barack Obama. Of those making under $50,000, 60% voted for Barack Obama. The president did not do badly with middle-income and richer voters either, gaining 46% and 44%, respectively in each category. The three income categories are fairly split among the electorate, with the lower-income group representing 41% of the total vote. Mitt Romney gained 62% of the Protestant vote. Catholics and other Christians were split among the two major candidates. Those of no religion as well as Jewish voters gave Barack Obama a vote of confidence at 70%. Mitt Romney, who would have become the first Mormon president if he had won, also gained the large majority of Mormon voters: 78%. Those who went to religious services at least once a week were more likely to vote for Mitt Romney (59%). However, 55% of those who said they attended such services “a few times a month” voted for Barack Obama. Throughout the campaign, both candidates said it was all about the economy, and voters’ decisions largely came down to who they thought was best on the issue. Fifty-nine per cent of those polled said the economy was their foremost concern. Among those, a slight majority (51%) went for Mitt Romney. So how does this match with an Obama win? Fifty-four per cent of voters who named unemployment as their top economic concern voted for Barack Obama. The president also received many more votes from those concerned about healthcare and foreign policy, while deficit-minded voters strongly chose Mitt Romney. What matters most in Americans’ minds when they vote? About three in 10 wanted a “vision for the future” and another three in 10 wanted a president who shared their values. Those who wanted a vision for the future voted more for Mitt Romney (54% to 45% for Barack Obama). However, another two in 10 voters wanted a president who “cares about people like me”. They overwhelmingly voted for Barack Obama – 81% in total – a sign that Mitt Romney suffered an empathy gap among some voters. All numbers based on exit polling conducted by Edison Research across the United States on 6 November.